Near term volume oscillators showed climactic behavior on Friday. Short term breadth and volume oscillators are highly "overbought" and are due to find some "balance" to this same extreme. Because of this short term euphoria, the Open 10 TRIN readings are at their highest levels prior to the early October collapse with price continuing to show a high amount of daily indecisiveness. The jobs data comes out "worse than expected", and the market turns around and closes higher giving a sense of excitability in that we might have the worse behind us. After all, great "change" is coming according to the "usual suspects", and who are we to question such a metamorphosis? Intermediate term breadth and volume oscillators are in the first stage of recovery after the crash, but still remain deeply "oversold" at this time. Because of this current configuration in the intermediate term trend of money flow, where the majority of stocks continue to be soft in "character" in their individual structures, any short term negativity to this same plurality between buyers and sellers can produce sharp and highly volatile shake outs. 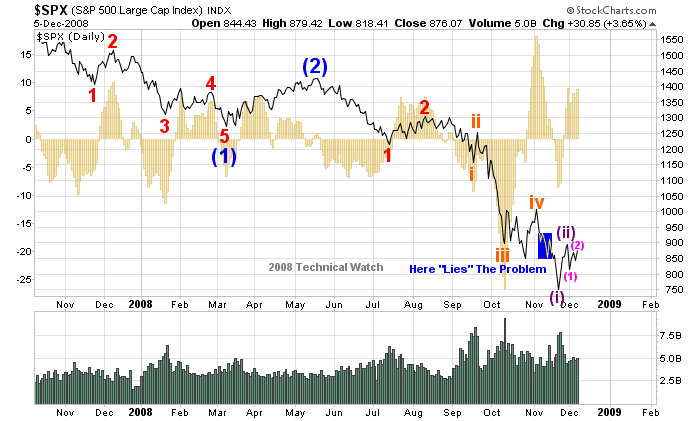 So with all of this background upon us, the Elliott price pattern should be rather easy to ascertain, shouldn't it? But as a purest of the rules and guidelines laid out by the namesake of this methodology, the trading activity in mid November has left us with an "overlap" which questions the validity of such a consideration shown below. But it could it be that those who want to forcefully counteract, what can only be the inevitable, be responsible for this one day aberration to the market's impulsive, compulsive behavior of making things right again? Rhymes and riddles abound...the cheese stands alone. As the market meandered nowhere fast for the past month, below is the updated count consideration(s) for your review. The biggest problem right now lies with the degree of trend that we're currently in, so presented below are two ideas until things clear up a bit. One idea is that we've have finished Minor wave 3 in November, and we have now completed Minor wave 4 earlier this month. If this is the correct count, Minor wave 5 of Intermediate wave 3 might be getting started. I say "might" because until the price lows of November are taken out, the current decline could still be part of a higher degree consolidation pattern (in this case, Intermediate wave 4). Alternately, the idea of an extended 5th wave of Minute degree is still possible given that the news that is accompanying the current decline from early January as having the same basis with many of the problems that drove the market lower with the October crash. If this is the correct interpretation, then we've finished off waves (i) and (ii), with wave (iii) of 5 now underway. 1) We're still in need of divergent highs in the volatility indexes. 2) We're still in need of higher Open 10 TRIN readings that would compliment the psychology of the October crash. 3) We still have downside price objectives based on the measuring gap created during the early October period that need to be met (724 and 588 for the cash SPX). 4) Many of the breadth McClellan Summation Indexes are now turning lower at or near their previous high levels accomplished during the August/September periods prior to the October crash. With today's lopsided breadth figures pushing the McClellan Oscillator(s) below their zero lines, we should expect at least a couple of weeks of backing and filling at a minimum, and if we're actually able to take out the November price lows, we should then have the necessary intermediate term divergences in place - across the board - where a more substantial rally can then occur. Other ideas are certainly welcomed, and I will provide additional updates as warranted. Dave, if you wouldn't mind humoring me a little here. Would you mind posting an EW count on the Dow Transports? Just really curious on this. According to the old "Dow Theory", transports are supposed to lead, and I don't see anything on the northbound front from the tranports. Thanks! 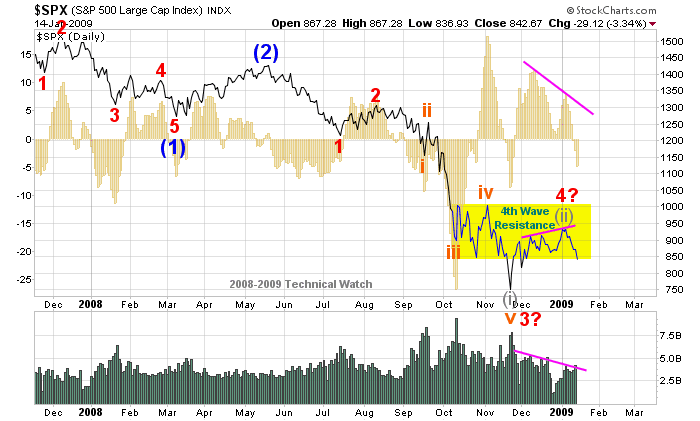 Would you mind posting an EW count on the Dow Transports? My apologies in my responsive delay, but hopefully I'll make up for it. 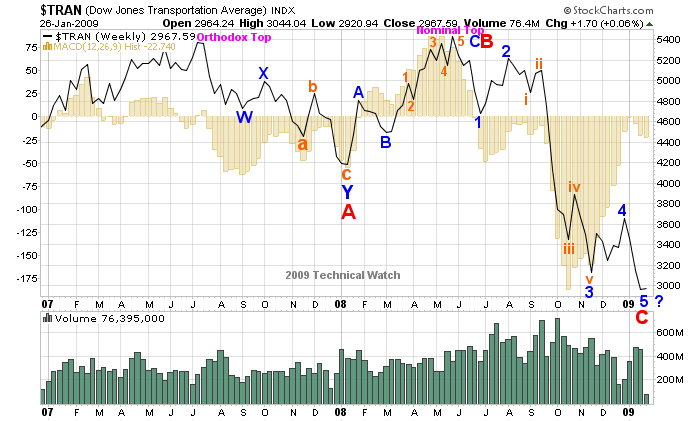 Whatever the case might be, it would appear that the Transports are close to bottoming, and like you've alluded to, with the Industrials usually about 2-3 months behind...Dow Theory wise. What do you think...are you smiling?? Yes, the triangle idea, in which Keene shows in his second chart, is still very much alive, and would also compliment the current internals along with the count ideas shared in the 1/14 post. One of which, the extended 5th idea, is losing more and more traction as each day passes as the lack of any impulsive structure in the daily SPX price pattern continues to suggest corrective activity. Anyway, we're getting closer to some sort of finality, we just don't know as yet how it will look, though the timing continues to suggest sometime in the spring. Thanks for the markup! Now I can definitely say I'm not smiling, more the look of bewilderment. Right now this is a far cry from the lows of 2003. The monthly MACD hasn't even attempted to turn back up, which has added to my bewilderment with your count. But again, looking at the weekly histogram, does show a washout. Thanks again, for all you do!